Give your students an ample dose of weirdness by introducing them to the new Dan Gutman series, My Weirdest School. 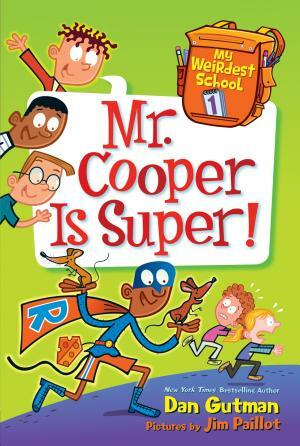 In book #1, Mr. Cooper Is Super!, Mr. Cooper thinks the best way to teach is to come to school disguised as a superhero. But when a real superhero is needed, can he protect the school or just embarrass it to death? Click here to learn more and to download free Common Core–aligned printables to go with this book. Then strengthen your math teaching and students’ learning with this book from the National Council of Teachers of Mathematics. Principles to Actions: Ensuring Mathematical Success for All provides a research-based description of eight essential mathematics teaching practices as well as the conditions, structures, and policies that must support the practices. Here’s an added bonus: place an order by June 30, 2015, and enter the code LRN0615 to save 25 percent! Check it out here. With warmer weather moving in, get your students out and moving with this open-ended set of outdoor favorites. The Get Out & Get Moving Kit has 59 pieces of recreation fun that are perfect for PE and recess. 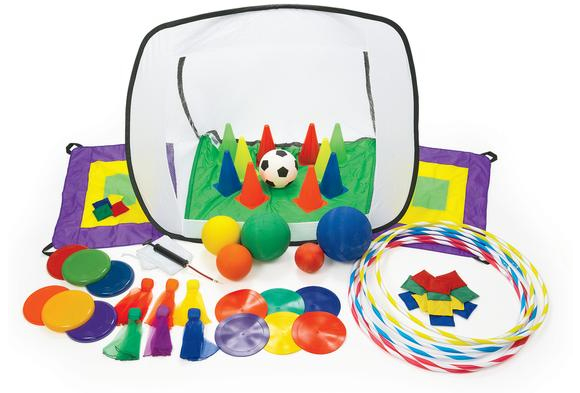 Set up obstacles using hoops, cones, and spots; encourage team activities; and play tossing games. Check it out here. Then enter to be one of two lucky teachers to win the set! Click here! Have you entered to win $500 in classroom cash, a year’s worth of award-winning Cabot Cheese, or a gift pack of Cabot Cheese products yet? What about the free resources—have you downloaded them yet? If not, better get “moo-ving”! 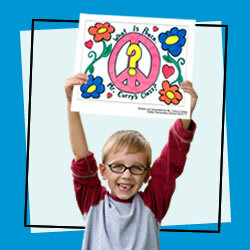 You can get Common Core activities for grades K–5, Healthy “Moos”! newsletters, and perfect-for-preschool theme units. From “Crazy for Dairy Cows!” to “The Calcium Connection,” your students are in for some learning fun! Find it all here. With the school year winding down, you can create a year-end keepsake and enter for a chance for your school to receive a $1,000 grant when you publish for free with Studentreasures. All books published by June 30, 2015, are eligible to be named the best student-created book in the nation. Prizes also include $100 for each individual student book winner along with a $15 gift card for the student’s teacher and, for classbook winners, $100 for the teacher and ribbons and reprints of the book for the students. Click here! Don’t forget; submit a comment for your chance to win the DVD/book/CD sets! I’m torn…the mom in me loves The Weirdest School books because his other Weird School series are my daughters favorites! The teacher in me loves the outdoor favorites. We are finishing up state testing this week, and my class needs to get out and have some fun! I bet your class does need to get out and have some fun after the testing! Hope it all went well! My Weird School has to be my choice. I had the wonderful opportunity to hear Dan Gutman at the Texas Library Association and my kids just love his books. I love the Get Out & Get Moving Kit. The Kindergarten playground sure could use some help! We have a postage stamp size piece of grass for the students to run on that is full of tree roots. These resources just might help them get some energy out while having fun! I love that Get Out & Get Moving set. That would be so great to have for outdoor recess and to do physical education integrations with. My Weird School is a great choice! The two new books sound lovely. We all need a way to feel we are making a positive contribution to our community. I love the outdoor activities! I love the outside activities. I have a copy of Someday but have never read extra yarn. I would love to read that book. I would love to read the book about mathematical practices. Thanks for letting us know about it! I love the new book Extra Yarn, I am a knitter and have taught children to knit. 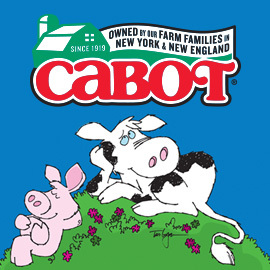 I am also from Vermont where Cabot cheese is made, so delicious and they have three new flavors. I will be teaching at Summer School and would love to win the Get Out & Get Moving Kit. I love the Get Out and Get Moving set. This would be a great resource to get kids moving and to promote team building as well. I am very interested in the book entitled Extra Yarn. I do read alouds often and could see this book serving as a springboard for activities or crafts with yarn. Choose ME!!! The book Somdeday sounds like a wonderful book to add to my collection. I would use this book at the beginning of the year with my first graders to let them know they can be anything they wish to be. It would be a great read aloud for May and Mother’s day. Like their own mother, I want the best for them as well. Extra Yarn is the perfect book to share with students as we teach them the importance of reaching out to others. What a terrific way for them to learn what life is about: helping others not just yourself! Someday and my weird school are my favorites. My kids have read some of the weird school books and love them so this would be a great addition to my class library. Someday is a great book to read before Mother’s Day or at the beginning of the year to show that moms aren’t the only ones who love and care about children. I discovered the “My Weird School” series with my 2nd graders late last school year. This year, we motored through ALL the “My Weirder School” and all but one of the “My Weird School Daze” books. They are fun, silly, easy to read and reflect current trends. Wonderful starting chapter books for my kiddos!